BBC NEWS | Health | Is real NHS choice possible? MPs want to make patients consumers by giving them the right to choose their own treatment. But does the complex nature of medicine and structure of the NHS render true choice impossible? Choice is the buzz word of the moment in the NHS. As the political parties gear up for the expected general election next year, MPs have been pushing their visions for the health service. And they all involve giving patients freedom to choose their own care. Just as a consumer decides what to buy off the shop shelf, MPs say patients should be entitled to decide which hospital they are treated at and perhaps even which doctor treats them. And patients seem to agree. A survey of 300,000 patients by the Healthcare Commission during the summer found the majority, especially when it came to mental health, wanted more say in their care. Patients Association chairman Michael Summers said: "I think there is an appetite out there for choice and it is refreshing that the government and other parties are willing to offer it." However, the major problem, according to Mr Summers, is whether patients can exercise that choice. At the moment the two key sources of information patients can use are waiting lists and hospital star ratings, hotel-style ratings from zero to three. Mr Summers said: "I am not sure there is enough information there for patients. "At the moment it is hard for people to see work out which hospitals have the best outcomes. "There needs to be a greater role for GPs, everything seems to go on the internet these days, but we must remember not everyone, especially the elderly, is internet-literate." He also said he was "dismayed" by the reluctance of surgeons to provide individual performance data to enable patients to choose. 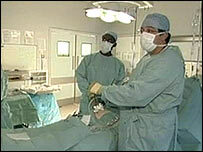 No information is currently published on individual surgeon and consultant performance. Heart surgeons are perhaps the closest to providing their own league tables. This year they published data for individual teams, comprising of three or four surgeons. As yet the Society of Cardiothoracic Surgeons has refused to commit themselves to a deadline for revealing more, arguing the current information does not take into account the fact that the best surgeons often take on the most risky cases. And the Royal Society of Surgeons goes one step further, arguing giving patient access to individual data does not even help patient choice and would prove too expensive. A spokeswoman said: "There is so much that goes into producing a good patient outcome and the contribution of all members of the surgical team is essential. "It is our belief that unit specific data would be much more useful in informing patients and driving up standards." The Royal College of Physicians (RCP) takes a more conciliatory view, saying it is not against releasing the data but questioning how useful it will be. Data is already collected on all patient / doctor contacts in hospital, including the diagnosis, intervention and length of stay. However, crucially it does not include information on how successful the treatment is. Professor John Williams, RCP's director of informatics, said: "Giving patients choice is a good thing but it is not clear whether this information is that useful. "Consultants tell us the data that is kept is not always accurate as patients are not always seen by the same doctor but quite often the system does not take account of this. "It is also not in a presentable form that would make sense to a patient. It is going to take a bit of time to get it right." And it is the issue of complexity that has led some people to conclude choice is not always a good idea. In a government-funded study, the National Consumer Council quizzed 2,000 people earlier this year and found one in five people struggled to understand even the most basic health information. A majority of people did not read medicine information leaflets, ask GP questions or search the internet for health information. The figures were particularly high among poorer social groups. The NCC concluded "health literacy" needed to be improved before true choice could be exercised. Tony Harrison, a senior researcher at the King's Fund, a health think tank, said: "The nature of medicine means that for many conditions their are lots of treatment options and they are not straightforward. "It is not just a matter of analysing mortality rates. "There can be different side effects and different risk associated with treatment and patients are not always easy with the concept of risk. "Some people want to know all about the treatment and are willing to invest the time to understand it but many don't want to know or find it difficult to understand. "For example, I just had a cataract operation and was reading about the side effects. It was difficult to understand." Despite the concerns, the government and opposition parties maintain choice can be achieved. A Department of Health spokesman accepted information was complex but said patients would be guided through the system with the help of GPs. "Ensuring easy access to high quality information about public services will be essential if we are to see equitable access to choice." Shadow Health Secretary Andrew Lansley said the Tories would use the electronic booking system to give patients access to clear information on consultant waiting times, clinical performance, readmission rates and patient experience surveys. "Through this they will be able to make an informed choice and to book an appointment at the hospital of their preference," he said. And Liberal Democrats health adviser Emily Frith acknowledged patients needed more information to make choices but said it could be achieved through the star rating system and risk-adjusted data on surgeon performance. "Patients want control of their care and access to care closer to their home. We will give them that."